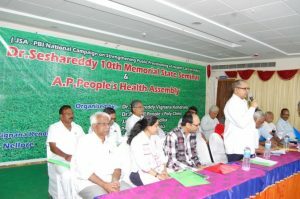 Nellore, the Mecca for Peoples Health Activists of Andhra Pradesh hosted Andhra Pradesh Peoples Health Assembly. 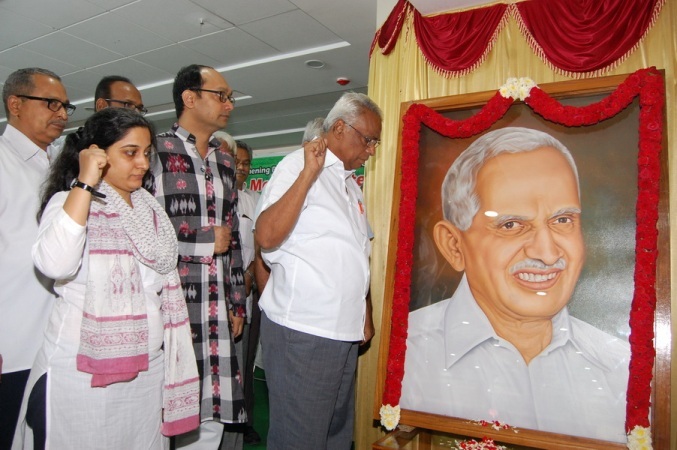 The assembly was held on 16th September 2018 at Dr JS Vignana Kendram, named after Dr. J. Sesha Reddy, who was a dedicated peoples doctor, a passionate health activist and the architect of Dr. PV Ramachandra Reddy Peoples Poly Clinic. 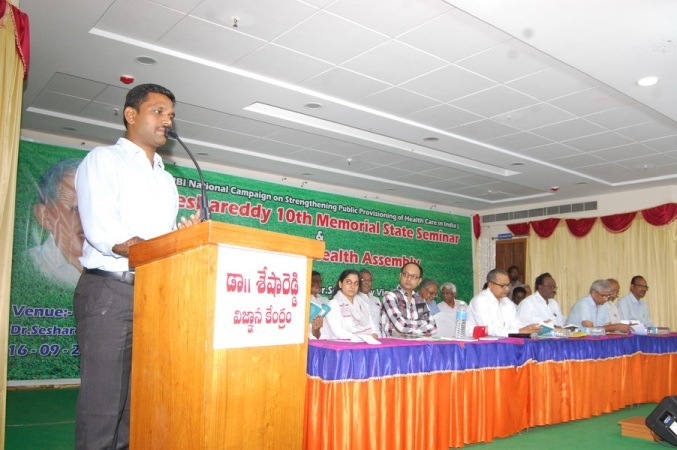 This assembly was held along with Dr. J. Sesha Reddy 10th annual memorial seminar. Dr. P. Ajay Kumar, Superintendent of Dr. PVRRPPC People’s Poly Clinic presided over the assembly. 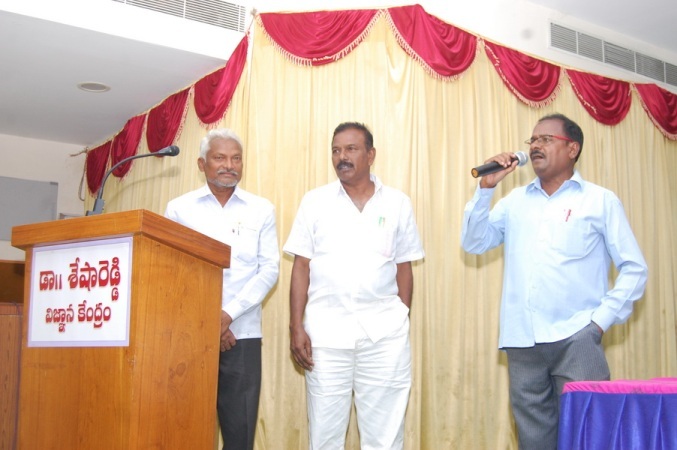 Mr. V. Balasubramanyam, MLC and senior leader of Jana Vignana Vedika inaugurated the assembly. He is the floor leader of Progressive Democratic Forum (PDF), a forum of five MLCs who won in the election with the backing of peoples movements. He made a very interesting observation; AP Legislative council is supposed to discuss on health sector in the forthcoming week. But the legislators were requested by the officials, off the records though, not to ask any questions on health issues, since there is no minister for health in the state and the officials are not in a position to give answers! He expressed his regret that at a time when the state is gripped by fevers and so many people were dying helplessly, we do not have a health minister. And then he remarked that since the legislative house is not in a position to discuss peoples health issues and solve the problems, it is appropriate to hold the Peoples Health Assembly at this juncture. He recollected a recent incident, where a nursing mother, who was recovering after delivering a baby, slipped from her bed in the over-crowded maternity ward of Government General Hospiital, Vijayawada and died. He doubted the reliability of morbidity and mortality data of the government of Andhra Pradesh. While the government claims that deaths due to malaria and dengue are very low in the state, doctors in their private conversations are denying the claim, observed the MLC. He gave a call to people, civil society groups and progressive political parties to build peoples health movement to strengthen pubic health systems and ensure Health For All. He expressed his willingness to raise the issues in the legislative council. Mr. Indranil Mukhopadhyaya, from Jan Swasthya Abhiyan made a power point presentation on “National Health Protection Scheme: Peoples money, Private profit and the nemesis of public health system”. 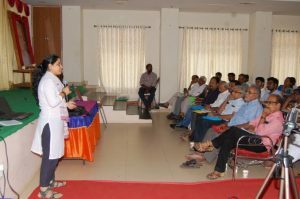 He started with explaining the basic concepts of healthcare financing and then went on to analyse how the existing social insurance schemes failed to bring down the out of pocket expenditure of the poor patients. With the help of rich data, he established that these schemes could increase rate of utilisation of private medical facilities and thus helped improving their revenues. With multiple layers of intermediaries, these schemes incur huge amounts of administrative costs, reducing the efficiency of healthcare delivery system. He reminded the audience of the instances of unnecessary procedures and surgeries like hysterectomies, cataract operations etc. NHPS alias Modi care alias Ayushmann Bharat is just going to be one such social insurance scheme, of curse at a larger scale, which only means that greater revenues for private and corporate hospitals. It provides a coverage upto Rs.5,00,000 per family per year. Ten crore families will be covered under the scheme. The fact that the scheme was rolled out n the final year of the tenure of the government and that a meagre amount was allotted for the scheme, speaks volumes about the intentions of the government, he observed. Most important problem with the private medical sector is that it is unregulated. Whatever little regulation exists, in the form of Clinical Establishments Act, it doesn’t regulate the prices in the establishments. Handing over huge amounts of money to unregulated private and corporate hospitals will only result in unethical and irrational care. Instead, this money should be spent on strengthening public hospitals. It is also important to improve the efficiency and accountability in public hospitals. Apart from bureaucratic regulation, community participation in monitoring and planning public health services is essential to improve functioning of Public Health Systems, he concluded. He extended his invitation for NHA-3 on behalf of JSA national secretariat the people and health activists of Andhra Pradesh. 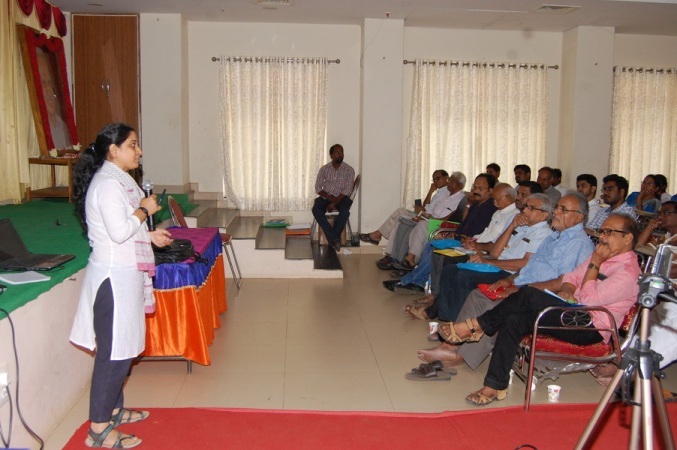 Ms. Richa Chintan from Centre for Budget and Governance Accountability made a power point presentation on the plight of poor public health systems in India and observed that inadequate budget allocations are one of the most important reasons for this. She narrated how JSA and PBI came together to start a national campaign on strengthening public provisioning of health care in India. In the first phase, the campaign is started in six states, including Andhra Pradesh. She shared good practices and. Important outcomes of the campaign. While improving the understanding of budget groups on peoples health issues, the campaign deepened the understanding of JSA on budget issues, she observed. She gave call to the health activists to take the issue of inadequate budget allocations to people. When the people understand that they have a right to health and right to access to medical care and that it is denied because of inadequate budget allocations to health, they will join the fight for ‘Health for all’. Dr. V. Brahma Reddy, a veteran public health activist and popular science writer, spoke on the unethical and irrational medical practices. He observed that the governments are intentionally undermining public health systems and promoting private and corporate hospitals. People are being mislead by the dominant perception that only corporate hospitals can give the best medical care. 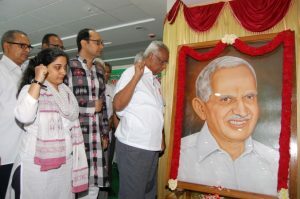 He urged people not to fall into the trap of medical consumerism. He gave a call to all progressive forces to come together and work together against the commercialisation of medical care and undermining of the democratic spaces. Mr. Y Srinivasulu Reddy, PDF MLC released a book titled “Vaidyaniki Susti” which means illness to healthcare. It is the Telugu version of ‘Dissenting Diagnosis’, authored by senior JSA leaders Dr. Arun Gadre and Dr. Abhay Sukla. It was translated by Dr. S. Suresh, Praja Arogya Vedika, AP state Convenor and was published by Prajasakthi Book House, the leading publisher of progressive literature in the state. Dr. Suresh introduced the book to the audience. 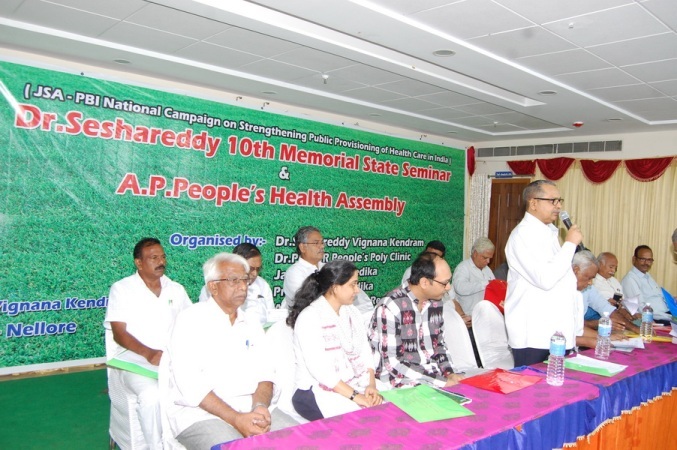 Mr. G. Srinivasa Rao, PAV Nellore District secretary welcomed the guests on to dias and introduced the background in which the state peoples health assembly is held. He explained about national and international peoples health assemblies to be held at Raipur and Dhaka respectively. Dr. MV Ramanaiah, PAV state convenor; Dr. B. Rajeswara Rao, PAV Nellore district president spoke. Representatives of all the organisations, that took part in organising the assembly gave their messages of solidarity. Delegates from three districts presented the report of surveys conducted on public health facilities. They narrated the stories of denial of healthcare in public facilities. Surveys are still going on in many districts Detailed report of the facility and exit interviews will be prepared after completing all the surveys. 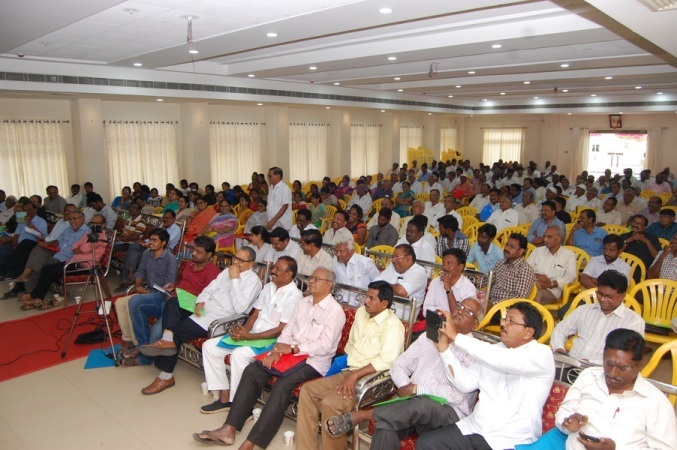 About 350 delegates attended from across the state. This entry was posted in Andhra Pradesh. Bookmark the permalink.